Marion Downey, NDARC Communications Manager: Professor Shane Darke has recently completed a study which found a big increase in the number of sudden deaths and overdoses where the benzodiazepine alprazolam was involved. Professor Darke, what are benzodiazepines? Professor Shane Darke: Benzodiazepines are tranquilisers and sleeping tablets. So people use them if for instance they have anxiety disorders, to calm them, or if they’re having trouble sleeping, to aid in sleep. Marion Downey: What’s different about alprazolam? Shane Darke: What’s different about alprazolam is that it’s a very powerful benzodiazepine and it’s a very rapid onset, that is its effects come on very quickly after you consume it. Marion Downey: Why did you do the study and how was it designed? Shane Darke: We did the study because we were seeing evidence amongst drug users, and there was also anecdotal evidence, that there was a problem with this particular drug. And we thought well, what we need to look at is – I suppose you could call it – the pointy end of this: is it being involved in deaths? What we looked at is every death going to the Department of Forensic Medicine in Sydney that had alprazolam detected in their blood. So this is any unnatural death or any sudden or unnatural death in which the drug was detected. Marion Downey: What were your main findings? Shane Darke: The main findings were there had been a major increase in the number of cases presenting with alprazolam and, more importantly, a major increase in the number of cases where alprazolam was contributing to death. We had three cases where it was present in 1997. By 2012, there were 86 cases, representing 1 in 20 cases that presented to the Department of Forensic Medicine. Marion Downey: What were the deaths? What were the main types of deaths? Shane Darke: The main types of deaths were overdose deaths and the two major ones, mostly, overwhelming, accidental overdoses. People that weren’t intending to die but using alprazolam in conjunction with other drugs, in particular such as the opiates or alcohol, were indeed dying. Marion Downey: Who is most likely to get into trouble with alprazolam? Shane Darke: Well, the problem with alprazolam is that it became very popular amongst people who were existing drug users. We’ve known for a long time that existing drug users, say heroin users, like benzodiazepines. But the other group, and this represented one in five of our accidental deaths, were not injecting drug users, they were people that were perhaps using strong painkillers such as oxycodone. Now who’s going to get in trouble is people that are, in particular, people who are using alprazolam in conjunction with alcohol and opiates. Because the drug - while you may use alprazolam by itself, alcohol by itself or indeed the opiate by itself – you might have been fine. It’s people who put these together, their risk of death is very high. The thing also we should know is quick acting drugs always have what we call a very high abuse liability. That is, they are very seductive, people are more likely to be dependent on them, and they are more likely to develop problematic use patterns. Marion Downey: Just going back to that, the reason why their risk of death is high, is those three drugs you mentioned, they’re common types? Darke: Yes. The three drug classes – alcohol, the benzodiazepines and the opiates – are all respiratory depressants. That is they act in the central nervous system to reduce your rate of respiration and what kills people in for instance a heroin overdose, is that the brain forgets to tell the body to breathe. What you find is it’s the same with benzodiazepines and alcohol. You take any of those in sufficient quantity, you will stop breathing. The combination, that is you put them together, you’re getting the additive effects of all these different drugs and that’s the particularly high risk pattern. That really came out in this study. It’s consistent with what we know about deaths more broadly. These were what we call multiple drug overdoses. That’s the standard overdose and I think people need to know that. Marion Downey: What is your message for the general public who take strong painkillers and anti-anxiety medications? Shane Darke: I think that they need to monitor their use and recognise what they are using and to follow the instructions. If a drug like Xanax or indeed a strong opiate painkiller says ‘do not use alcohol with this’, it’s not just there for no reason. The reason is because the combination can actually kill you. My message is that people need to be aware that even though none of those drugs that they’re using might be illegal drugs, they may still have a drug problem, and a drug problem in particular if they’re taking enough of those in combination. So they take their Xanax, they take their painkiller, then they get drunk, that could be enough to kill them. Marion Downey: The [Australian] government recently reclassified alprazolam as a Schedule 8 drug. What difference do you think that will make? Shane Darke: I think it’s excellent public health policy, in my opinion. I think what it’s done is raise the bar. The problem has been that there’s a lot of Xanax out there, there has been, and that was shown in our study, it was coming up in deaths. What we know from earlier examples where they’ve rescheduled drugs is that use declines dramatically. Now I don’t want people to think that no-one should have this drug. There are people who will use it responsibly and it’s appropriate. But what we’re doing is raising the bar so that it will be harder to prescribe, it will be monitored more closely and there will be less prescriptions out there. So I expect the number of deaths involving Xanax to decline. Marion Downey: Thank you. That was Professor Shane Darke. 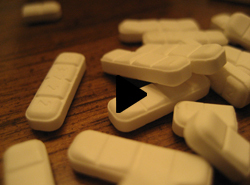 Image: Xanax 2mg by Dean812 on flickr. Production: Gavin Entwistle and Erin O'Loughlin.